During my PhD I was busy with lots of things, collecting data, processing data, analyzing results, and so on. Late one evening on my way home, I am about to leave the building and ran into Peter Goldreich, a professor in Planetary Science. I started explaining all of the things I am busy doing and he advised me to stop and think a little, that it was more important than doing a lot. Relying on busy work diminishes our creativity. How can the very small “think a little” be more important than the by definition ginormous “doing a lot”. You can’t ever get something from nothing, right?! – I guess the point is not everything is measured in the same way, or with the same scale. The really marvelous thing about today is I got to the point where I was actually thinking about what we are trying to do out here. On the 16.5 hour flight from Dallas to Hong Kong, I had reviewed the cruise objectives and things were clear in my head. But that got lost really quickly. Ok, we want to come up with a model that explains the opening of the South China Sea that is constrained by data, so actual observations. Some models already exist for how continents break up and ocean basins form. Like in most cases in the Earth Sciences, there are two end member models and then variations in between. However, ocean basins are some of the most difficulty features to fully understand because they are covered with water and access to the rocks and deep layers is at best limited. On the other hand, the rocks beneath the ocean basins are relatively young, much less complicated and way less weathered and worn than the continents. It is therefore pretty straightforward to unravel their history once you can get to them. The South China Sea is a good place to test existing models because we already know quite a bit about the region. Our research can add to that picture and refine it. It has also stopped opening, which to me is the more interesting part and understanding why and how would be really cool. Here is a pic of the Core Rack. 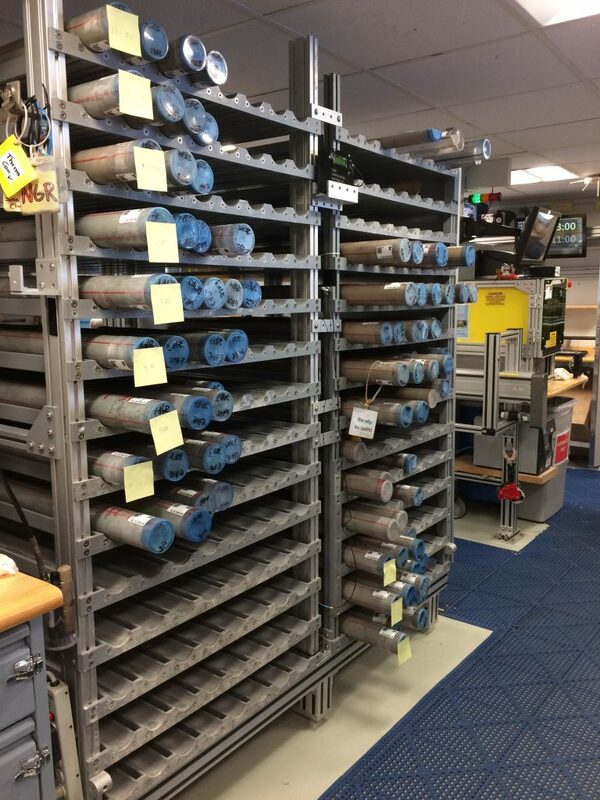 This is where the cores (sediments or rocks in those plastic tubes that have been extracted from hundreds of meters beneath the seafloor) sit for roughly 4 hours so they can equilibrate to room temperature before we start analyzing them. Lots of things change when deep rocks are brought to the Earth’s surface. This means the properties we are measuring in the lab are not perfectly representative of the rock within the Earth, but they can be pretty close.